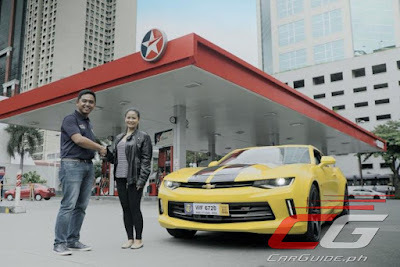 Caltex, marketed by Chevron Philippines Inc. (CPI), recently awarded the grand winner of “True Power from Within” with a brand new 2017 Chevrolet Camaro RS A/T and P 100,000 worth of Caltex Starcash to go with it. The nationwide promotion for Caltex customers was in conjunction with Michael Bay’s latest Transformer’s installation, Transformers: The Last Knight. With the Transformer’s movie tie-up, CPI made every customer’s trip to their local Caltex station even more rewarding as an instant souvenir of a Transformers: The Last Knight collectible tumbler was available for customers after gassing up with any Caltex product. May you have Joy with your Camaro!! !